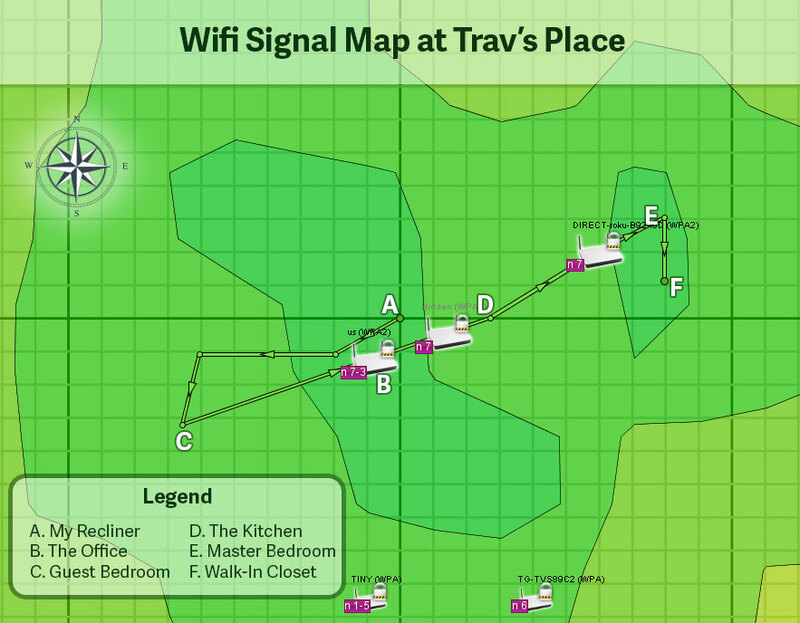 Here’s the wifi signal map taken at my house on June 26, 2015. 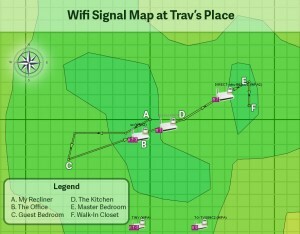 HeatMapper seems pretty accurate since the indicated wifi signal strengths match what my devices usually tell me. The program could definitely help to troubleshoot slow wifi in a crowded neighborhood as it provides channel information for all detected hotspots. I have no crowding here: There are only two other routers I can see and the signal is so low they couldn’t interfere with a gnat. One thing I ran into before being able to complete this fun-waste-of-an-afternoon project is that your wifi chipset has to support monitor mode (or promiscuous mode, as it was called back in the day :). If a chipset doesn’t support it, HeatMapper just sits there waiting for signals and nothing shows up. Not surprisingly, the Intel Centrino Wireless-N 2230 chipset in my laptop doesn’t support monitor mode. I remembered that I bought a Netgear N300 Wi-Fi USB Adapter last year to help with a project I worked on (which had been buried in the back of the Jeep, long-forgotten). I plugged it in an HeatMapper immediately started picking up signals.